I am a huge fan of growing your own produce. Gardening is not only great exercise but it is also a wonderful way to get organic produce for way cheaper than you see it at the store or farmer’s market. 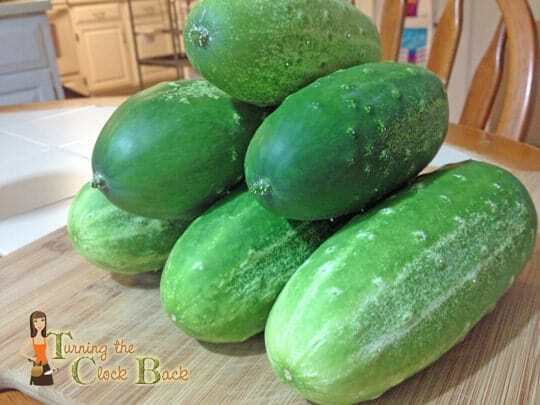 This summer, I tried a different approach to growing cucumbers. I normally plant a rather long variety of cucumber in hills in my garden. This is probably what most people do, right? Well, I have trouble with them taking up too much room and getting eaten by bugs as they hang out in the mulch around the garden beds. This year I chose a smaller, heirloom variety of cucumber and decided to try growing it on a trellis. Well, this was certainly a brilliant idea on my part and I am now left with about 47 cucumbers to try to eat! This cucumber mint sauce will use exactly ONE of those 47 cucumbers! What am I going to do with all the other ones? Now, I love cucumbers….I can eat them multiple times a day as a snack, an accompaniment to dinner, or as a topping on my sandwich. However, I have already reached the point where I am starting to wonder what to do with them. I have been passing them off to neighbors and am considering making a batch of pickles but tonight I decided to try a cucumber mint sauce for my salmon. Cucumber and mint pair beautifully together and I have both of these items in abundance in my garden. 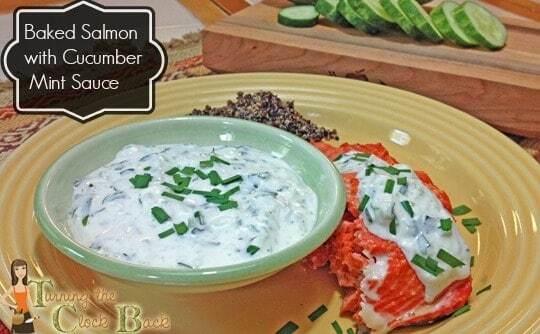 Throw in some fresh chives and tangy yogurt and you have a wonderful sauce to add to just about any seafood. I chose salmon but it would go well with other types of seafood as well. If this cucumber mint sauce recipe isn’t quite up your alley but you need to use up your own garden cucumbers you can try making Tzatziki, which is very similar and goes great on burgers or as a dip for veggies. Drizzle salmon with olive oil and bake at 350 degrees for approximately 15 minutes, depending on thickness. Fish should flake with fork with done, do not overcook! While fish is cooking combine all ingredients in a small bowl and mix well. What are you doing with all your garden cucumbers this year? I haven't had salmon in a long time. This sounds really good!